I don't understand how you can make dried pasta gourmet. Pasta in a fine restaurant? Sure, there's skill required for the preparation. I can tell the difference between cold SpaghettiO's from a can and quality gnocchi at a restaurant, mainly because the latter does have an aura of desperation. Dried pasta, the kind you boil, may vary slightly in taste. But most of the flavor in pasta is the sauce, or fillings, or in the fresh preparation. I fail to see how a $115 tin of pasta actually scales in terms of quality. 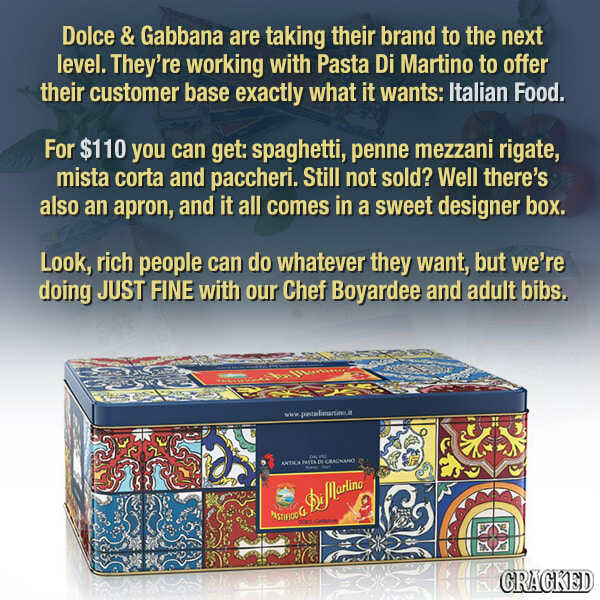 But say the appeal of this pasta is just the designer aspect, a sort of superficial signaling of superiority. Pasta as a status symbol doesn't really work. If someone Instagrams themselves eating a pile of "designer" pasta, I won't feel envious. This boil-it-yourself designer pasta looks the same as regular poor people pasta. The fact they include a designer apron in the tin isn't any better. Aprons are glorified bibs: they're for catching marinara sauce splatters so that after you take off the damn apron you won't look like a chainsaw murderer of tomatoes. Maybe rich people have just run out of things to feel superior about. Cars, glasses, handbags, clothes, shoes, dishes... there's little left to flaunt. Maybe we should act like we're impressed with their fancy pasta, so they end this madness before trying to pass off Hot Pockets as a $300 "Portable Deconstructed Pizza" by Calvin Klein.